On Sept. 25, Benderson Development Co. launched a new website and a Facebook page in an effort to garner public support for its proposed Siesta Promenade project at the northwest corner of U.S. 41 and Stickney Point Road. The Facebook page also promotes a YouTube video about the plans. “Check out this video to learn more about the proposal to transform a former 300+ unit mobile home park, office building & contaminated gas station into a new, vibrant gateway entrance to the area,” a Benderson post says. The YouTube video, it adds, may be found at the following link: https://www.youtube.com/watch?v=UgVSZsL0d2c&feature=youtu.be. On Aug. 23, when county staff members and Todd Mathes, Benderson’s director of development, conducted a county-required Neighborhood Workshop on the company’s plans, many of the approximately 400 attendees bombarded them with negative comments. 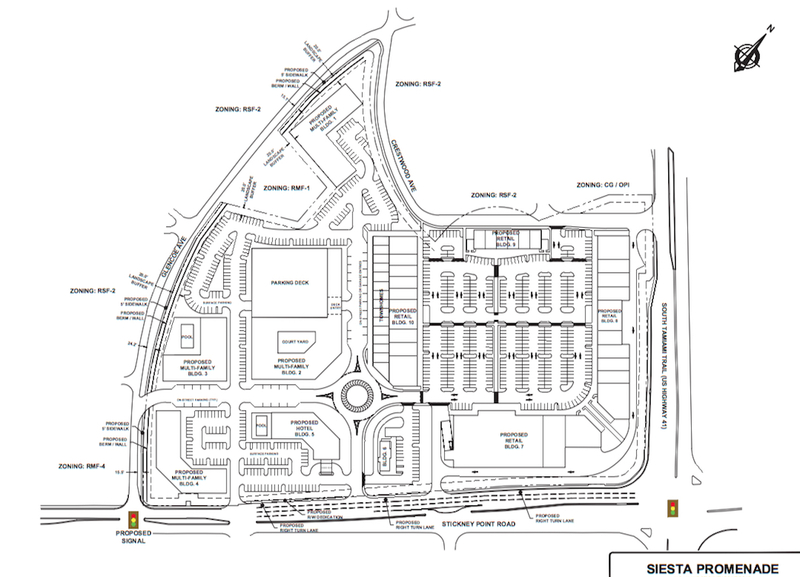 A number of speakers focused on the expectation that the mixed-use project would exacerbate traffic congestion at the U.S. 41/Stickney Point Road intersection. Since Mathes unveiled Benderson’s revived plans for the project in June 2016, public comments have been predominantly negative. Along with the public transportation issues, residents of Pine Shores Estates — who would be Siesta Promenade’s immediate neighbors — have protested the proposed 85-foot height of the hotel next to their community of mostly one-story, single-family homes, and people have pointed to significant shift to online shopping, with many retail centers struggling to find tenants for long-vacant storefronts. On Nov. 15, Benderson is scheduled to have its first public hearing on its petitions for a Critical Area Plan designation and rezoning of the approximately 24-acre Siesta Promenade site. The Sarasota County Planning Commission will address the proposal for the project that evening; its meeting will begin at 5 p.m. The County Commission has set aside a full day — Dec. 12, beginning at 9 a.m. — to consider Benderson’s applications. The company has proposed 414 condominiums/apartments, a 130-room hotel and 140,000 square feet of retail and office space. Already, Mathes has faced criticism over his comments in the news release, including his assertion about the company’s ability to construct the “retail-only scenario” without the need of County Commission action. Kochman pointed out in her rebuttal that most of the 24-acre site slated for Siesta Promenade is zoned for a mobile home development. The County Commission would have to change that zoning to Commercial General to allow the “retail-only scenario” Mathes touted, she added. “TDT” refers to the county’s 5% Tourist Development Tax, or “bed tax,” which is charged on rentals of accommodations. 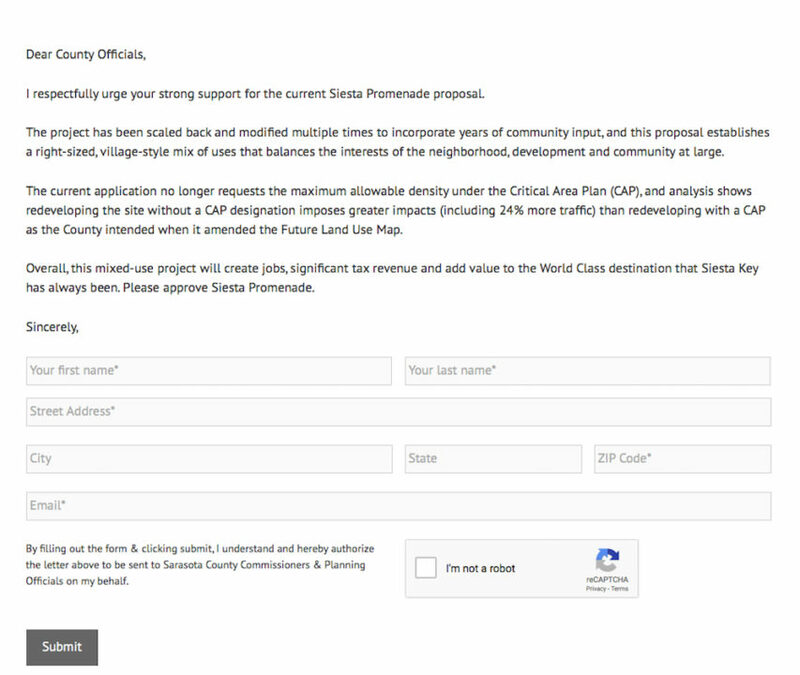 County Planning and Development Services Department staff has explained that Benderson would be required to make 15% of the condominiums affordable, if the County Commission approves the Critical Area Plan (CAP) designation for Siesta Promenade. The CAP would allow the company a density of up to 25 dwelling units per acre; the maximum density is 13 units per acre in Commercial General zoning districts. In her rebuttal, Kochman pointed out that, by her calculations, using those county figures, only 25 of the 414 Siesta Promenade units would be affordable. According to the U.S. Department of Housing and Urban Development, the median family income in 2018 for the North Port-Sarasota-Bradenton Metropolitan Statistical Area (MSA) for a family of four is $70,300. During an Oct. 3 review of comments on the Facebook page, The Sarasota News Leader found mostly negative comments. 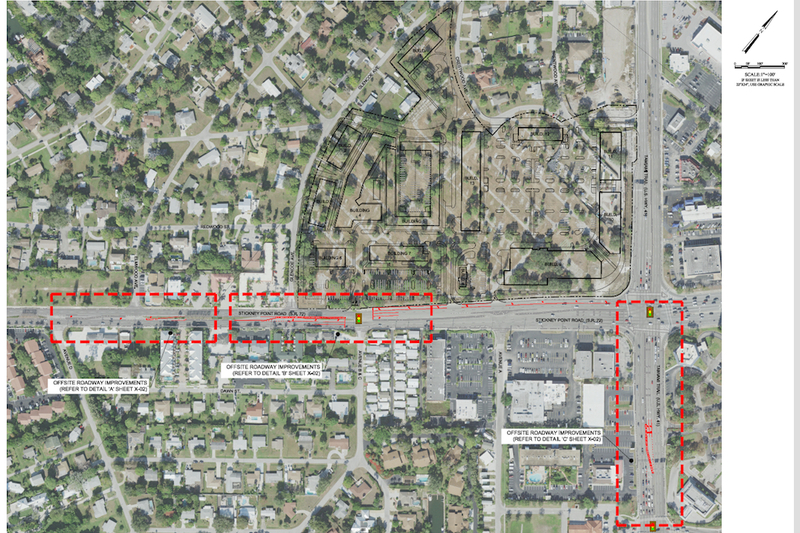 Similar to the situation during the Aug. 23 Neighborhood Workshop, many people have criticized the plans because of the additional traffic the project would be expected to create. A Sept. 26 post by Benderson emphasized the statement that the CAP designation for Siesta Promenade would result in “24% LESS traffic than a retail-only development …” The five people who responded to that post used the laughing emoji or the angry emoji. 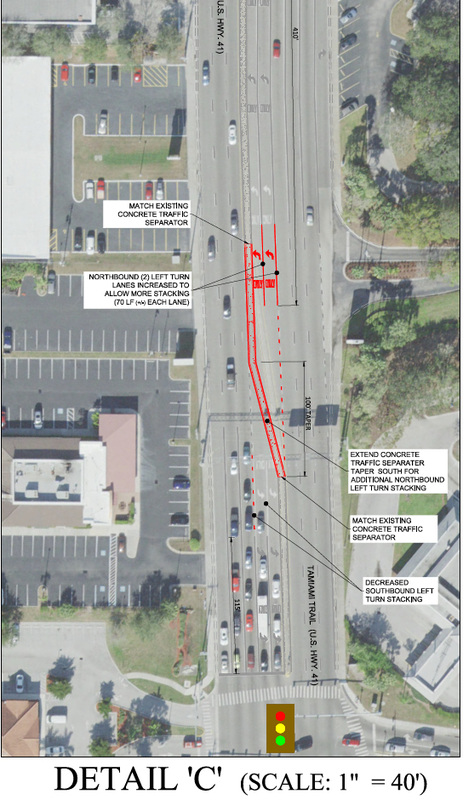 The company has suggested that a traffic light be installed at the intersection of Stickney Point Road and Avenue B and C. Mathes and representatives of the Kimley-Horn and Associates consulting firm in Sarasota, which handled the traffic analyses for the project, also have called for FDOT to re-time the traffic signals on the U.S. 41 corridor. FDOT traffic engineers have made it clear that while FDOT does re-time signals periodically, it would not take such action because of a specific project.